Android's notification shade is getting a lot more powerful in N, and two new APIs are the key to that: direct replies and bundling. On the surface, both of these things sound fairly unexciting, but in reality, they have the potential to make the notification shade a powerful multitasking tool that reduces the amount of time you spend doing quick tasks and entering apps when you don't actually need to. First, let's hit the direct reply API. 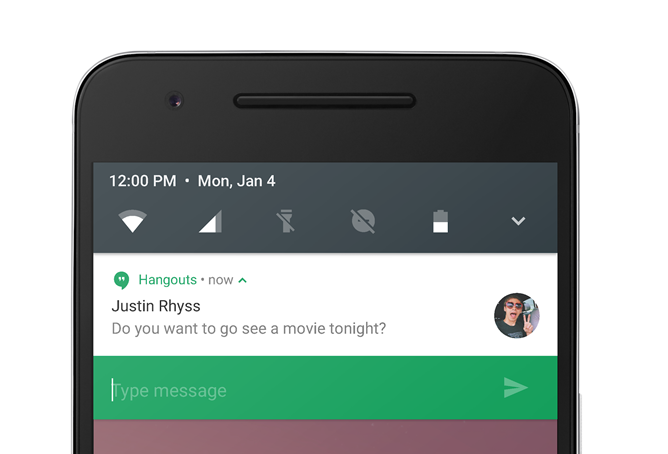 The wonderful ability to reply to messages in Google Messenger or Hangouts directly from the notification bar was, you may be surprised to learn, not a standard Android feature. It was actually a custom implementation, and other Android developers would have to come up with their own solutions if they wanted to emulate such rich actionable behavior in the notification shade. 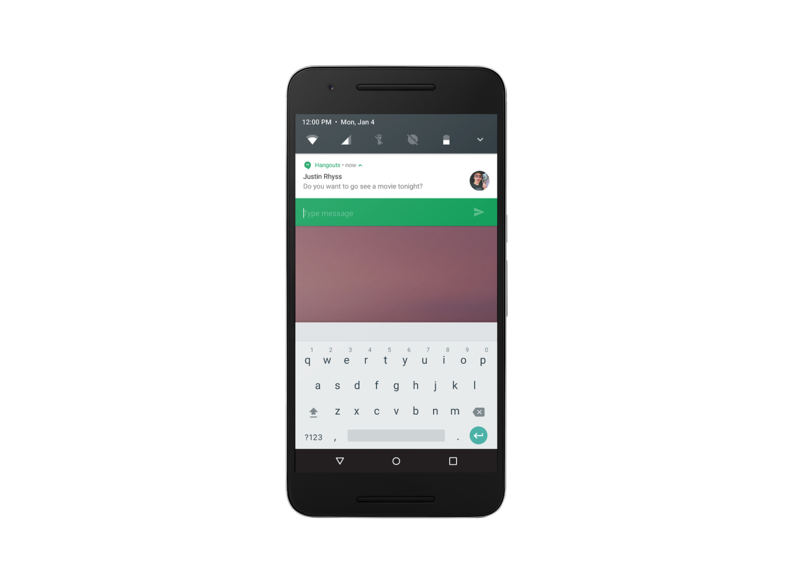 Now, with Android N, there's an API for that. Developers will be able to provide access to text entry for things such as messaging directly in the notification shade via the new RemoteInput API. This API was actually already on Android Wear, but this is the first time it's been made available to phones and other devices, and one of the implementations you'll hopefully be seeing in your favorite texting and messaging apps later this year is in-line replies directly from the notification shade. Who doesn't want this? It's one of the primary reasons I use Messenger as my texting app. Notification bundling is, depending on who you ask, possibly even more exciting. Don't you hate it when you get a notification with 3, 5, or more items in it, and you're basically forced into opening the app if you want to act on all the items individually? For example, if Inbox has 4 new messages in your notification bar, you can't do anything with any of them - you can either tap the notification and go to Inbox or dismiss the notification. Notification bundling allows you to "unfurl" that larger notification into 4 smaller notifications, each of which you can then act on individually. So, you swipe down on that "bundled" notification with two fingers, and smaller individual notifications with all the usual available actions then appear. You could take those four emails and "done" two of them, swipe away another, and open the last one to reply to in the app. While we don't have a visual illustration just yet (Update: now we do), this feature really is outstanding once you understand just how it works. Bundled notifications will be available to developers through the Notification.Builder.setGroup() method. This is just a taste of these new features, we'll have more information as the day and week goes on!